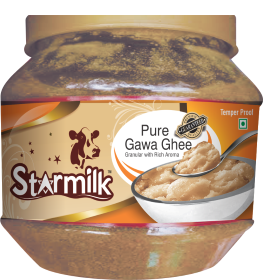 Starmilk Products Pvt. Ltd., based in West Bengal, is a nascent organization in the Food & Beverage industry. We focus on providing Premium Quality Milk Variants and Other Dairy Products to our Esteemed Customers. 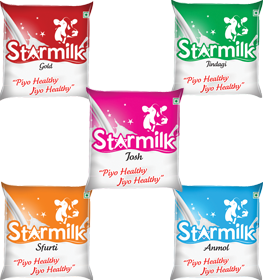 Our experts ensure that all the Milk Products are of High Nutritional Values as well as Good in Taste & Flavour. It is our aim to set up new benchmarks in standards of milk quality reflected in its taste, freshness, hygiene and availability. A secret to healthy life is healthy diet and milk constitutes a major percentage of the healthy diet in Indian consumers and that is why we have chosen our SLOGAN - “Piyo Healthy Jiyo Healthy” to reflect our Theme. Dairy products provide calcium, magnesium, phosphorus and protein for the sustained development of bones. 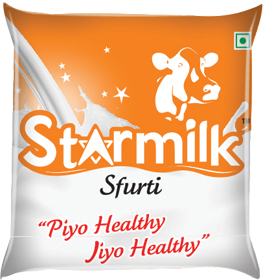 We, at Starmilk, make sure that the milk you consume would be best in taste and quality and will adhere to the perfect balance of nutritional values as your healthy drink. 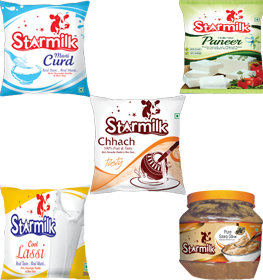 We procure, process, manufacture and sell Milk & Milk Products by using innovative techniques & integrated management system, coupled with a highly committed and dedicated team of Trained Professionals. We are committed to maintain high quality standards of Milk & Milk Products and set up new benchmarks for Premium Quality Dairy Products in West Bengal. To provide Premium Quality Milk & Milk Products to our consumers adhering to their expectations in terms of Taste, Quality and Safety. We aim to provide the best in quality standards, good taste, food safety and finally the utmost satisfaction of our Customers. 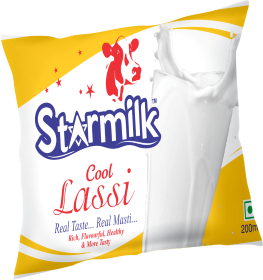 Starmilk plants are well equipped with latest & advanced processing facilities, having a total production capacity of 100,000 lpd (litres per day). The milk variants produced and processed here are standardized, homogenized and pasteurized. 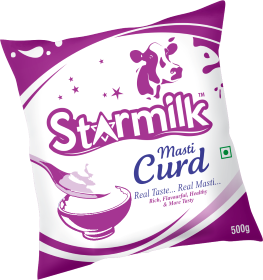 Then, these are packaged in pouches for final distribution to the end consumers through a well organised network of distributors, dealers and retailers. The technology and equipments used in the production process are reliable, safe and are of approved qualities. In justification to our aim to provide Premium Quality Milk & Milk Products, each product sample goes through a proper & stringent quality check before they are set out for distribution and final consumption. 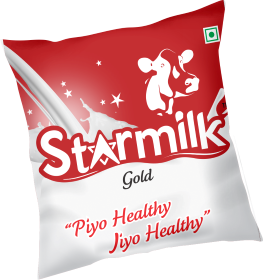 Starmilk is available in the different variants like Double Toned Milk, Toned Milk, Standard Milk, Cow Milk and Full Cream Milk. Pouches are available in different sizes like 200ml, 300ml, 500ml and 1ltr. 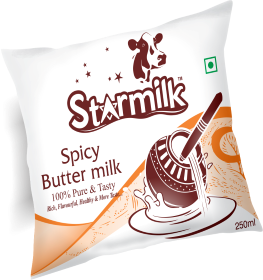 In addition to packaged milk variants STARMILK also manufactures a wide range of other dairy products. 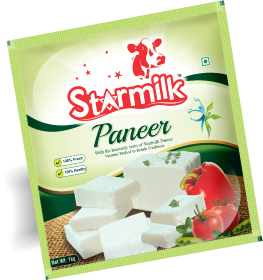 The entire range includes spicy butter milk, lassi, curd, paneer and ghee. All these products are available in different packaging like 200ml., 250ml., 500ml. and 1000ml. Packs.